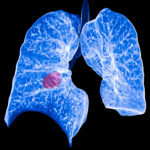 Statin use is associated with improved survival among patients with stage IV NSCLC. Although prior studies have displayed an anticancer effect of statins in patients with pancreatic and prostate cancer, the effect of statins on patients with lung cancer remains unclear. Researchers compared the survival of patients with stage IV NSCLC receiving statins prior to diagnosis with those not receiving statins. Investigators analyzed data from 5118 patients aged older than 65 years, who were diagnosed with stage IV NSCLC between 2007 and 2009. All patients were included in the Surveillance, Epidemiology and End Results (SEER)-Medicare database. Of those, 27% of patients were taking a statin at the time of cancer diagnosis. Results showed that median overall survival was 7 months among those taking statins versus 4 months in patients not treated with statins (P < .001). After controlling for multiple factors, researchers found that statin use was associated with both an improvement in overall survival (hazard ratio, 0.76; 95% CI, 0.73-0.79) and lung cancer-specific survival (hazard ratio, 0.77; 95% CI, 0.73-0.81). “Further research should evaluate plausible biological mechanisms as well as test the effect of statins in prospective clinical trials,” the authors conclude.